Stocks in places that are shuttered to fishing tend to grow older and larger and are better able to withstand stress. BOSTON – As fishermen around New England are the first to point out, this summer, much like the last, is in many ways abnormal. Ocean waters are warmer than ever. Fish are also less abundant, found in new and unexpected places and behaving in unusual ways. With ocean temperatures on the rise and atmospheric carbon dioxide reaching levels above 400 parts per million for the first time in human history, climate change is no longer an intangible, far-off event. It is now causing a host of new problems for fishermen, scientists and managers. Fishermen are reporting the changes they’ve witnessed, including catching species typically found farther south and at different times of the year. Fishermen in Maine report increasing numbers of black sea bass and longfin squid — species not traditionally seen in the Gulf of Maine — while fishermen in Rhode Island are catching warm-water species like cobia and mahi-mahi. Scientific studies agree with these observations — the changing climate is affecting fish stocks in ways we can observe, but cannot yet fully comprehend. These changes come at a time when the groundfish industry is struggling with significant quota cuts implemented in response to low abundance for many stocks. It has become increasingly clear over the last very difficult year that decisions about the future of the groundfish fishery need to be viewed through the prism of climate change. While not all of the blame can be placed on climate change — a history of overfishing, environmental degradation from pollution and coastal development and an increase in predators such as seals and dogfish may all be playing a role — the link between climate change and shifting fisheries is evident. Many species, including those such as cod and flounder, are shifting offshore and northward to areas of colder water. Climate change also seems to be hindering growth and reproduction, slowing progress toward rebuilding. How should we manage our fisheries and marine ecosystem in light of these ongoing changes? 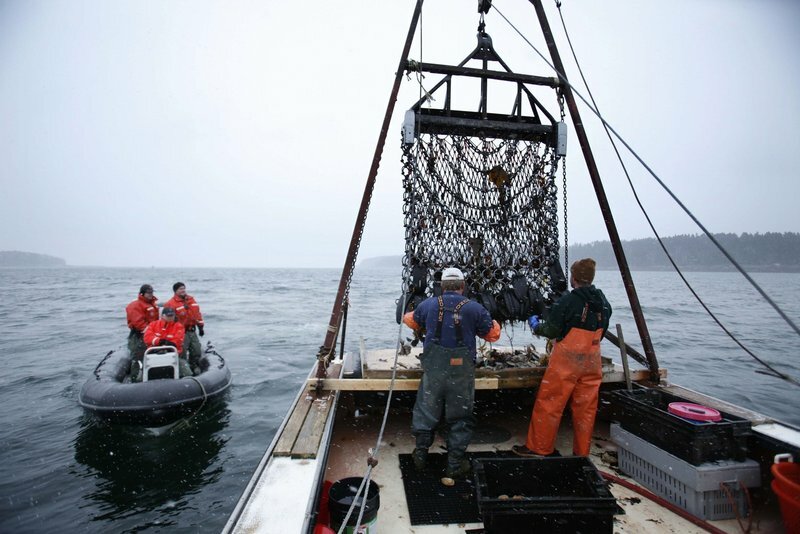 Scientists, managers and fishermen are all talking about the impacts of climate change on fisheries, while the New England Fishery Management Council develops its second Habitat Omnibus Amendment. The amendment proposes to redesign the current network of closed fishing areas based on updated scientific information and evolving management needs. The goal is to protect important habitats, and to increase productivity of groundfish stocks by protecting key life stages. However, the heightened urgency about climate effects has been notably absent in the deliberations about closed areas — even though many scientists and fisheries managers agree that closed areas are both an essential component of ecosystem-based management and a climate adaptation strategy. The refuge provided by closed areas can help fish adapt to temperature changes and a new assortment of competitors, predators and prey. At a recent symposium on climate change hosted by Maine’s Island Institute, Dr. Graham Sherwood of the Gulf of Maine Research Institute presented a compelling case for how closed areas are already delivering benefits in the face of climate change. Fish in closed areas tend to grow older and larger, and are better able to withstand climate-driven stress. Additionally, the increased uncertainty in sustainable catch levels brought about by these environmental changes can be buffered by the fish protected in closed areas. In other words, closed areas can be an effective insurance policy against uncertainty and climate-driven ecosystem changes. In fact, closed areas may be the best tool we have to support resilient fish stocks in the face of a changing climate. A closed area network for New England’s fisheries should be distributed strategically across the Gulf of Maine and Georges Bank to provide multiple refuges as stock distributions shift. This network can provide resilience against climate change in the near term, and can be adapted to meet changing conditions as species shift. An effective network is one that balances protection for the ecosystem along with the fishing industry’s need to access healthy stocks — providing an opportunity to address the effects of climate change on fisheries without adding to the economic constraints currently being felt by the industry. We have an opportunity to protect important areas of our ocean, rebuild fisheries and increase resilience against the impending effects of climate change. It is an investment in the future of the fish, and our fishing communities. The New England Fishery Management Council can make a commitment to confronting climate change and implementing ecosystem-based management now by thinking long-term as it continues the process of reconfiguring its closed area network. Dr. Sarah Smith is a member of the Ocean Project Spatial and Ecosystem Initiatives team at the Environmental Defense Fund in Boston.